Is the Channel in Europe Taking MPS Seriously Enough? 2/4 | Document Advisors | IDeAs blog, for better document strategies. There is clear evidence that even quite small organisations across Europe have now become aware of the opportunities presented by rationalizing their document output, and are adopting, or interested in moving towards MPS. 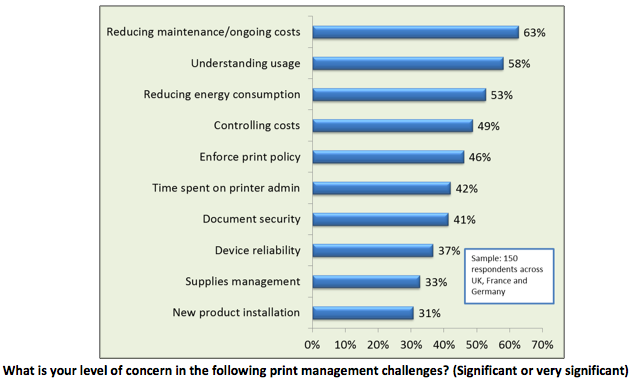 Recent research by Quocirca shows that among SMEs in the major European countries, issues related to rationalizing print and managing/reducing costs already have a high level of salience. Furthermore, the same research showed that over 50% of organisations with 250-500 employees said they were already using some form of MPS, and a further 40%+ said they were planning to do so. 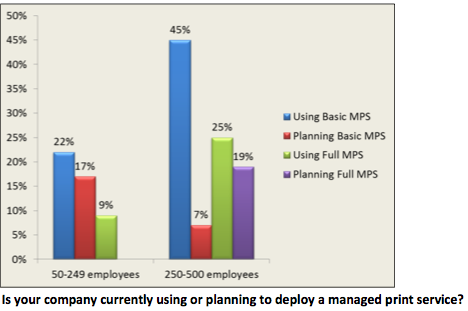 Even among organisations with 50-249 employees, almost 50% said they were using, or planning to use MPS. There are additional factors driving the adoption of MPS. These include a generational shift in user behaviour, towards more team working, which makes shared output devices more acceptable. 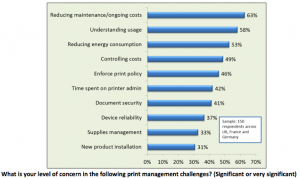 Another factor is increasing pressure on IT departments, and their need to focus on core business applications, instead of spending time and resources supporting everyday functions, such as printing. Overlaying all of this is the general trend towards outsourcing of functions which are seen as non-core. This is also where there are differences between countries in Europe. Although outsourcing is well established in many Northern European countries, especially the UK, and more generally among large international organisations, it is less well accepted in France and Southern Europe. This appears to be partly due to differences in culture, and also to the greater prevalence of small businesses in these countries. In addition, there are specific issues in certain countries. For example in Germany, there is a very high level of concern about data security and privacy, which results in resistance to allowing external providers to audit and manage document output, especially in the “Mittelstand” of often family-owned mid-sized companies, which form the backbone of German industry. Is the Channel in Europe Taking MPS Seriously Enough? 4/4 | Document Advisors | IDeAs blog, for better document strategies. This article was written on 26 Sep 2013, and is filled under Business Forecast, Managed Print Systems.